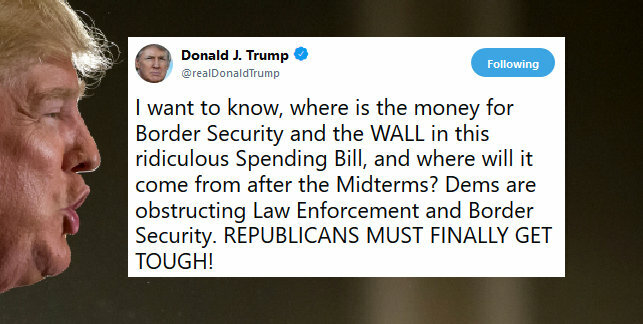 Trump Bashes Congress: Where's My Wall Funding? - Joe.My.God. The Senate voted 93-7 on Tuesday to pass a sweeping $854 billion spending bill that includes funding for the departments of HHS, Labor, and Education, which make up the bulk of government spending. Of the seven senators who opposed the bill, six were Republicans who joined Sen. Bernie Sanders (I-Vt.) in voting “no.” The House is expected to take up the funding legislation next week, ahead of the Sept. 30 deadline to keep the government funded.